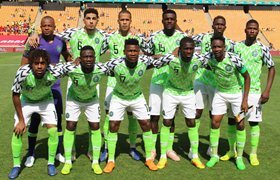 Allnigeriasoccer.com understands that all the twenty-three players invited for the 2019 Africa Cup of Nations qualifier against Seychelles have reported for international duty. The last five players to join the national team at their get-together in Asaba are Hapoel Beer Sheva's John Ogu, Stoke City's Oghenekaro Etebo, Anorthosis Famagusta goalkeeper Francis Uzoho, Wolfsburg loanee Victor Osimhen and Galatasaray star Henry Onyekuru. Though Super Eagles manager Gernot Rohr will be delighted with the arrival of these five players, it remains to be seen whether they will be involved in the full workout or hold a recovery session as they arrived in Asaba few hours ago. Rohr will specially monitor Akwa United's Ndifreke Effiong and Brighton's Leon Balogun in today's first training session on grass as there are question marks surrounding their fitness. Effiong sustained a knee injury last weekend in a Nigeria Professional Football League clash while the central defender has been inactive since February 6 due to a shoulder injury.